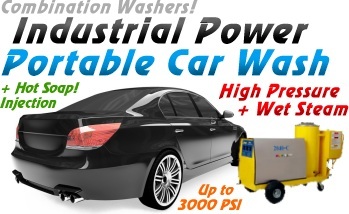 CARWASH Steam Machine: 200-PSI Wet Steam & up to 3000 PSI Hot Water for FAST CAR WASH Services. OEP Stands for Oil heated Electric Pumped the C stands for full Combination wash system. Jenny invented the worlds First Steam Cleaner, back in 1927! Todays systems are multi function. Its a Hot Water High Pressure Washer, Cold Water High Pressure Washers & a high volume Wet Steam Cleaner! Featuring max outputs of up to 3000 PSI (depending upon model below) @ 140° F hot water, cold water High Pressure, or up to 200 PSI of 325° F wet steam all in one machine! 100% American made, and might I add, done with pride. If you don't mind a some water, then these are the best of the best, the cream of the crop. The fact that you can switch between high pressure cold water, hot water and wet steam as well as inject soap in any mode makes the C series a winner. 3 Machines in one! See optional configurations below. More Power = faster cleaning & rinsing. Want even more? We have units up to a massive 3500 PSI and 10 GPM! Call for more information! The three below are our top recommendations for the car wash business. Great on boats, cars, trucks, air craft, tractors, equipment, pavement and more. Dimensions: 60 x 26 x 34"
The C-OEP Class are 3 way Full combination pressure washing & wet steam cleaning systems. Even the beginner can learn to use this system in minutes with Its EZ push button operation. Just connect your pressure hose, add the heating fuel, connect your water supply using a common garden hose, plug it in and your ready to work! These units have 3 settings. 140° F Hot water pressure washing, Cold water pressure washing and 325° F super heated wet steam ALL IN ONE UNIT! Switch between cold and hot water with a flip of a switch or pop on the quick connect steam tip for super heated, sanitizing, disinfecting wet steam cleaning at pressures ranging from 100 to 200 PSI. In any one of these modes you can activate the hot detergent injection system. These units come with 5 quick connect tips providing many different spray patters for all kinds of jobs. These portable, powerful units also comes standard with a extra long 50' heavy duty hose & 5 foot safety wand. Jenny Combination units are very easy to operate. The lighted Motor, Burner, and commercial Steam Clean Pressure Wash switches are conveniently located and visible to the operator glowing Red In the Off position and Green in the On position. Changing from the industrial Pressure Wash mode to the Wet Steam Cleaner Mode is as simple as changing a tip in the end of the gun and flipping the mode switch. Upgrades and options are specially designed to simply bolt-on the machine. Continuing our long standing tradition of reliability, we use only the highest grade components in our manufacturing processes. The drive system is either an industrial grade electric motor or a high performance OHV gasoline engine. The high pressure pump is a belt driven, oil bath, ceramic plunger pump. Jenny's specially designed Twin Fire Modular Gun Burner system is at the very core of all our oil fired machines. Featuring a 5 year limited warranty via the Jenny Corporation, the heavy-duty, powder coated, 10 gauge steel, modular chassis was engineered to withstand years of rugged and punishing use and yet fit through a commercial doorway. All major components such as the fuel tank, stainless steel float tank, coil casing, back panel, and the front panel are bolted to the chassis. Jenny Oil Fired Combination Units demonstrate the culmination of advanced engineering, state of the art manufacturing, and extensive steam cleaner and pressure washer experience dating back to its inception in 1927 by Jenny. These units combine an extensive list of standard features with rugged strength and versatility. The Combination Units, like all Jenny Oil Fired units, incorporate Jenny's Twin Fire Modular Gun Burner System featuring 18,000 Volt Twin Electrode Ignition System, Belt Driven 6" Diameter x 4" Wide Blower System, Adjustable Air Intake, and a Belt Driven Fuel Pump. This constant duty burner system allows for clean and efficient combustion of Kerosene, Diesel, #2 Home Heating Oil, or JP-4 Jet Fuel. Since these are Jenny Combination Power Cleaners, you get the versatility of 3 cleaners in 1. With the flip of a switch, the machine can go from a cold pressure washer to a hot pressure washer. Change the tip in the gun and flip the machine selector switch, and the machine becomes a 325ƒF steam cleaner. 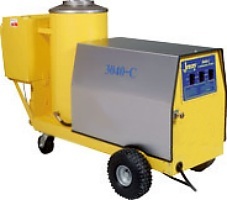 The high performance, heavy-duty heated units will clean any task both quickly and effectively. Pressures in the pressure wash mode range from 750 to 3000 PSI and volumes range from 2.3 to 5.0 GPM, they will make short work of fleet, farm, and construction equipment cleaning, light degreasing, floor and building cleaning. And if the work warrants it, simply change the tip in the end of the gun and flip a switch and the unit becomes a powerful commercial steam cleaner for superior degreasing and sanitizing ability.